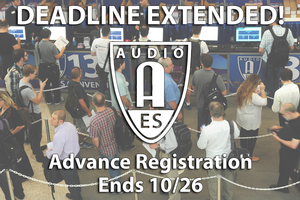 If It's About Audio, It's At AES, and the AES Convention is on track to break registration records once again.AES is extending FREE Exhibits-Plus and discounted All Access Advance Registration through midnight, October 26; attendees can be a part of history while saving themselves money and time. The 139th International AES Convention runs October 29 – November 1, 2015, at the Jacob Javits Center in New York City. The 139th AES Convention features presentations from the most influential names in Broadcast and Streaming Media, Recording and Mastering, Game Audio, Live Sound, Networked Audio, Archiving and Restoration, Product Development, and more. Now’s the chance to sign up for your FREE pass to come be a part of the largest pro audio event of the year. The 139th Convention offers all attendees access to hundreds of pro audio manufacturer exhibits, Live Sound Expo (LSE) and Project Studio Expo (PSE) events stages, Opening Ceremonies and Keynotes, GRAMMY SoundTables® panel, the Platinum Events series, and more – FREE with Advance Registration Exhibits-Plus badge. Many attendees choose to upgrade to the premium All Access badge, for an even more immersive Convention experience, with four full days of comprehensive Tech Program presentations, Workshops, Tutorials, Paper Sessions, and Student & Career Development events. One and Two-day All Access badge options are also available. For the latest information on the Audio Engineering Society 139th Convention in New York City and how to register for your FREE Exhibits-Plus or premium All Access badge, visit http://www.aes.org/events/139/.